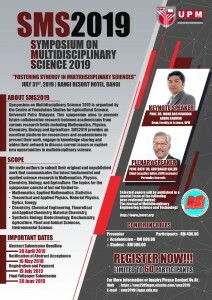 Symposium on Multidisciplinary Science 2019 is organized by the Centre of Foundation Studies for Agricultural Science, Universiti Putra Malaysia. 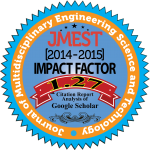 This symposium aims to promote future collaborative research between academicians from various research fields including Mathematics, Physics, Chemistry, Biology, and Agriculture. SMS2019 provides an excellent platform for researchers and academicians to present their work, engage in knowledge sharing and widen their network to discuss current issues or explore new opportunities in multidisciplinary science.